A microstratigraphic study of the Hobbit cave, Liang Bua, reveals the use of fire between 41,000 and 24,000 years ago. 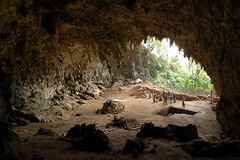 The dates suggest that Homo sapiens used the cave after Homo floresiensis and fueling speculation that modern humans were responsible for the extinction of the hobbits. Liang Bua, a karstic cave located on the island of Flores in eastern Indonesia, is best known for yielding the holotype of the diminutive hominin Homo floresiensis from Late Pleistocene sediments. Modern human remains have also been recovered from the Holocene deposits, and abundant archaeological and faunal remains occur throughout the sequence. The cave, the catchment in which it is located and the gross aggradational phases of the sediment sequence have all been subject to a great deal of scientific scrutiny since the discovery of the holotype of H. floresiensis in 2003. A recent program of geoarchaeological research has extended analyses of the site’s deposits to the microstratigraphic (micromorphological) level. The stratigraphic sequence in the cave is well defined but complex, comprising interstratified sediments of diverse lithologies and polygenetic origins, including volcanic tephras, fine-grained colluvium, coarse autogenic limestone gravels, speleothems and anthropogenic sediments, such as combustion features. The sedimentological and chemical heterogeneity suggest that processes of site formation and diagenesis varied markedly through time, both laterally and vertically. We present initial results from samples collected in 2014 from an excavation area near the rear of the cave, which yielded radiocarbon ages from charcoal that fill an important temporal gap in the chrono-stratigraphic sequence of previously excavated areas of the site. The results indicate marked changes in site environment and hominin activity during the Late Pleistocene, relating primarily to the degree to which the cave was connected to the hydrogeological system and to the varying intensities of use of the cave by hominins. Importantly, we identify anthropogenic signs of fire-use at the site between 41 and 24 thousand years ago, most likely related to the presence of modern humans. This week’s been abuzz with another Hobbit story again, this time saying that the diminutive bones belong to malnourished humans rather than a new species. The paper, written by two Australian researchers in the Proceedings of the Royal Society, B: Biological Sciences, posits a new theory that the hobbits were sufferers of dwarf cretinism. Fossils from Liang Bua (LB) on Flores, Indonesia, including a nearly complete skeleton (LB1) dated to 18kyr BP, were assigned to a new species, Homo floresiensis. We hypothesize that these individuals are myxoedematous endemic (ME) cretins, part of an inland population of (mostly unaffected) Homo sapiens. ME cretins are born without a functioning thyroid; their congenital hypothyroidism leads to severe dwarfism and reduced brain size, but less severe mental retardation and motor disability than neurological endemic cretins. We show that the fossils display many signs of congenital hypothyroidism, including enlarged pituitary fossa, and that distinctive primitive features of LB1 such as the double rooted lower premolar and the primitive wrist morphology are consistent with the hypothesis. We find that the null hypothesis (that LB1 is not a cretin) is rejected by the pituitary fossa size of LB1, and by multivariate analyses of cranial measures. We show that critical environmental factors were potentially present on Flores, how remains of cretins but not of unaffected individuals could be preserved in caves, and that extant oral traditions may provide a record of cretinism.